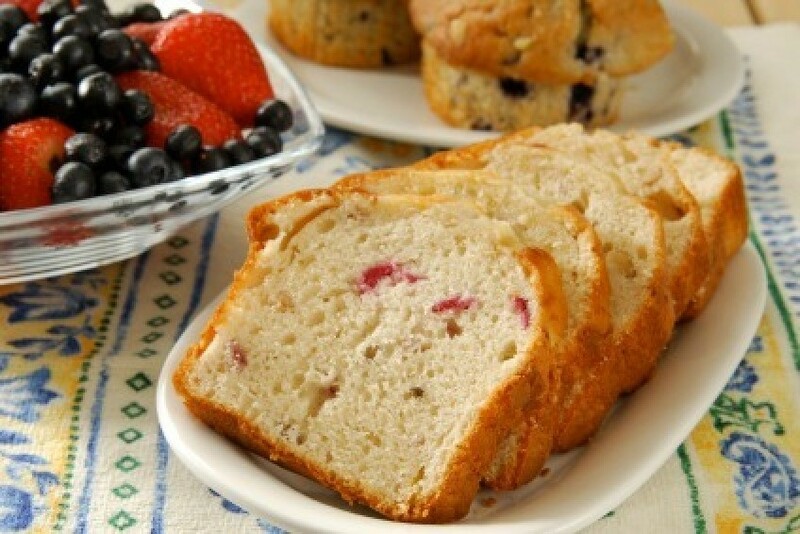 Although good anytime, the holidays intensify our craving for cranberry bread. This page contains cranberry bread recipes. A moist quick bread that I serve every Thanksgiving. Coat 9x5x3 inch loaf pan with nonstick cooking spray and dust with flour. In large bowl, combine eggs, sugar, oil, yams, and vanilla. In separate bowl, combine flour, cinnamon. allspice, and baking soda. Make a well in the center. Pour yam mixture into well. Mix just until moistened. Stir in cranberries. Spoon batter into prepared loaf pan. Bake for 1 hour or until toothpick inserted in center comes out clean. Preheat oven to 325 degrees F. Cream shortening and sugar in bowl until light and fluffy. Beat in eggs and bananas. Add flour and soda; mix well. Mash cranberry sauce with fork. Fold sauce and walnuts into batter. Pour into 2 greased and floured 9x5 inch loaf pans. Bake for 1 hour or until loaves test done. You may dust top with confection/powder sugar or make a cream cheese frosting or serve warm with a scoop of ice cream on top. or a white glaze topping. This is a great holiday bread! Sift dry ingredients together. Add beaten egg, shortening, orange juice, and hot water. Combine only until dry ingredients are moistened. Fold in nuts, cranberries, and orange rind. Pour into a greased loaf pan. Bake at 325 degrees F about 1 hour, 10 minutes. Great holiday or every day bread! Preheat oven to 350 degrees F. Combine eggs, oil, sugar and vanilla in bowl; mix well. Sift in dry ingredients; mix well. A good Holiday bread recipe or just any day. 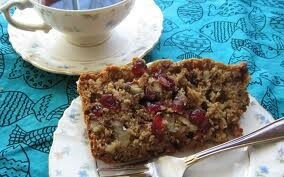 I would like a recipe for cranberry walnut bread like that sold at Starbucks. use a food processor to chop the walnuts and cranberries if you have one- its a huge timesaver! Preheat oven to 350 degrees F (175 degrees C). Grease three 8x4 inch loaf pans. Sift together the flour, salt, baking powder and baking soda. Add to wet ingredients, alternating with orange juice. Mix in the orange rind, cranberries and walnuts. Stir until just combined and pour into prepared pans. Bake for 30 to 35 minutes or until toothpick inserted in center comes out clean. I've had cranberry walnut muffins at Starbucks and they are wonderful. I wonder if this recipe could be adapted to muffins? Anyone know? This makes 3 small loaves. beat together eggs water and butter add to dry ing. remove from pans while pretty warm butter crusts with extra melted butter. Wrap in wax paper and refridge at least over night. Later wrap in saran wrap and foil if you are going to freeze them. To Debbie52: I'd cut the recipe in half or third (one egg) and try it for muffins. The cooking time / temp might need to be adjusted but on first try check other muffin recipes, make best guess and *write down any variations* you may use. After the first small batch you can make any adjustments needed for batter, time, temp, etc. I have 3 questions. Do you have to use baking powder when using self-rising flour? Can you use dried cranberries instead of fresh/frozen? Can you use 1/4 cup vegetable oil instead of butter? You can use dried crans instead of fresh. Self-rising flour already has baking powder in the mix-you can check the package ingredients to be sure. You can substitute oil for butter, same measurements. The result of changes 1 and 3 will be a somewhat different bread. If I were making the recipe, I would soak the dried crans in warm water for a couple of hours and I would not substitute oil for butter. This is not to say that your result would be inferior, just different. I much prefer butter over oil for taste, structure and (I believe) quality in any type of baked recipe. Can these recipes (oven baked bread) be adapted for a bread machine? Yes, just make sure your bread machine is big enough for the recipe. Use quick acting yeast and put the ingredients in the pan according to the manufacturers directions. I always put mine on the dough cycle and then bake it in my oven. But you can do the whole thing in your bread maker if you wish.